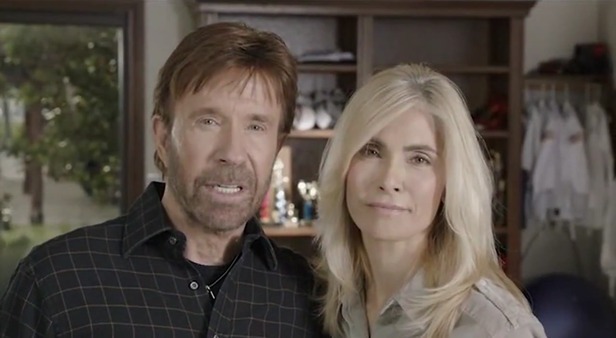 In a two-minute video posted on his official YouTube channel, which also includes work-out tutorials and promotional appearances for “The Expendables 2,” Norris and his wife Gena warn of a “growing concern” that the America we know can be lost forever if Obama is reelected. Gena then cites the statistic that in 2008 more than 30 million Evangelical Christians stayed home on Voting Day and Obama won. Reagan gave his “A Time For Choosing Speech” in 1964 on behalf of then-Republican presidential candidate Barry Goldwater, who eventually lost to Lyndon B. Johnson. Goldwater’s campaign was hurt by a lack of support from his own party as well as the unpopularity of his politically conservative positions. Divided Republican party followers decided to stay home rather than vote for a candidate they did not like. In January, Norris endorsed Newt Gingrich for president. In May, after Gingrich dropped out of the race, the “Walker, Texas Ranger” actor offered his support to Romney in an article penned for NewsBusters. Norris joins other celebrities who have publicly endorsed Romney, including Clint Eastwood, Jeff Foxworthy and possibly Nicki Minaj.